I am so excited to do this. Y'all know how much I love nail polish. Found this at Lipgloss & Crayons. November 5th - 9th: Sign-ups, tell your friends - the more the merrier! 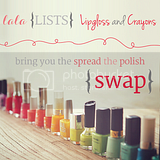 November 26th: Link-up, introduce your swap partner, and show everyone what you got! If you sign-up you are agreeing to mail two polishes to your assigned partner (don't sign up if you think you won't be able to uphold you end of the bargin). Well that and have fun!